28 years ago, an alien space craft resembling a floating, metal land mass appeared in Africa, just over Johannesburg. The world held its breath, not sure what to expect next – a beginning or an end. The ship’s passengers were not as alien as one would expect. They stood upright, had offspring and, as it would come to be discovered with time, harboured as much fear inside of them as man likes to pretend he doesn’t. Whatever brought them to our planet left their energy supplies depleted and their systems inoperable. Stranded here and at the mercy of man, the aliens struck what they believed to be a peaceful arrangement with the world’s governments and were housed in shacks in a segregated space designated as District 9. To imagine this description as our actual world is almost ludicrous when the words are just being read on a page. 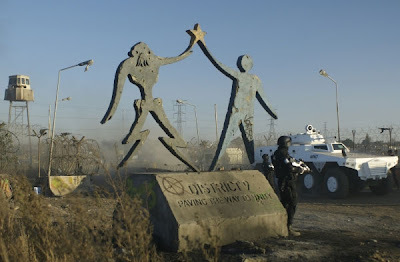 The beauty of Neill Blomkamp’s first feature, DISTRICT 9, though, is that he creates and fosters this scenario as a reality that does not only seem plausible but more so as one that actually happened. I almost expected a whole other world to be waiting for me outside the theatre when the film was done. In 2005, Blomkamp’s short film, ALIVE IN JOBURG, caught the attention of the Internet and one key man in particular, Peter Jackson. Seeing just how stunning the visuals could be and how rich the subject was, Jackson put $30 million down to allow Blomkamp to make whatever he wanted. He wanted to make his short into a feature. Blomkamp has been passionate about this project ever since he was a boy, growing up in South Africa during apartheid. 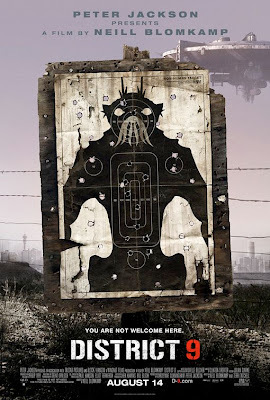 Although not applied to all racial groups, like in Africa between 1948 and 1994, Blomkamp’s version keeps the aliens and the humans separated and, as with any class system, there is hatred, animosity and mixing between the groups. 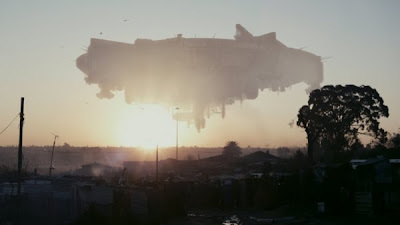 DISTRICT 9 is a pastiche of different film captures, from news footage to security cameras in stairwells to helicopter shots. All blend seamlessly together to not only form a stunning aesthetic but the documentary style, including talking head inserts from authorities on the alien plight, cements Blomkamp’s world in our own. The believability factor is what makes the injustices against the alien race so repugnant. DISTRICT 9 directly implicates the viewer as a passive observer and forces you to take sides. Realistically, we aren’t there; we cannot say what we would do but we still cannot help feel the same fears. To be alien is to be foreign and, as a species, we certainly struggle with accepting that which is different than ourselves, even within our own species. To make matters worse, these aliens, while fascinating to watch from a CGI perspective, are not exactly pleasant to look at. They are lanky creatures with numerous tentacles and limbs that are so vividly constructed that one can almost imagine they smell as rotten as they look. As one could presume, an alien ship hovering over the earth for nearly three decades and 1.8 million aliens, though contained, living on this planet, would make even the open-minded uncomfortable to some degree. There are many alien interest groups established to protect the aliens’ rights but it almost seems naïve to think they do not pose some level of threat against humanity. And as it becomes more and more clear as the film goes on that humanity poses a bigger threat against them, you become torn between sympathy and preservation. At the center of DISTRICT 9 is a nobody turned into the greatest somebody on the planet overnight, Wikus Van De Merwe (played poignantly by non-professional actor, Sharlto Copley, who appeared briefly in ALIVE IN JOBURG). Wikus, a government employee in charge of serving all the aliens of District 9 with eviction papers before they are moved to a much more deplorable camp, is a bit of a goof who thinks he’s got it all figured out until he is forced to walk in an alien’s shoes (if aliens actually wore shoes, that is). It is only then that he can see humanity for the recklessly greedy creatures that they are. And as Blomkamp puts us directly in Wikus’s shoes, we too get the mirror turned on our own faces. It sounds bleak but it is still by far the most fun I’ve had at the movies all summer, if not all year. How many sheep would you give District 9? It wasn’t as wonderful as many people say, but it’s certainly a very entertaining film. 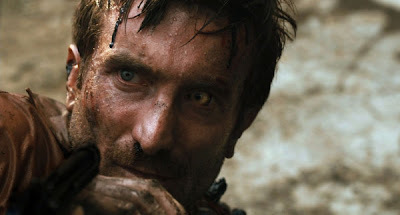 Sharlto Copley is amazing considering he’s not a professional!!. I absolutely love this movie. The originality factor of the story is debatable, but the way it was presented and executed in the script is phenomenal. I think it’s great because Neill Blomkamp didn’t rset out to make a movie with social commentary in it at first. He wrote it from the truth he experienced growing up in South Africa, and how it contrasted with life in a First World country like Canada. The real victory of the movie is that despite the fact that it’s a science FICTION, it feels very real. It’s definitely something South Africa should be proud of.